The T10 is a passive 2-way loudspeaker housing two 6.5″ drivers positioned in a dipolar arrangement and a 1.4″ HF compression driver and a passive crossover network. 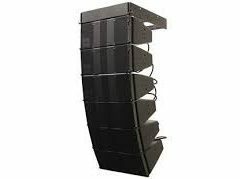 The T10 can be used both as a line array and as a high directivity point source loudspeaker. The HF driver is fitted to a unique waveguide horn producing vertical line source directivity with a 90° horizontal pattern that is maintained down to approximately 600 Hz. An acoustic lens placed in front of the horn widens horizontal dispersion to 105°, rotation of the horn by 90° relative to this produces an accurate point source dispersion, transforming a vertically oriented T10 into a stand-alone full range loudspeaker with 90° horizontal and 35° vertical directivity pattern. The T10 cabinet is constructed from polyurethane integral hard foam, incorporates integrated line array rigging hardware and has an impact resistant finish. The front of the loudspeaker cabinet is protected by a rigid metal grill backed by an acoustically transparent foam, and two EP5 or NL4 connectors wired in parallel are mounted on the rear panel.